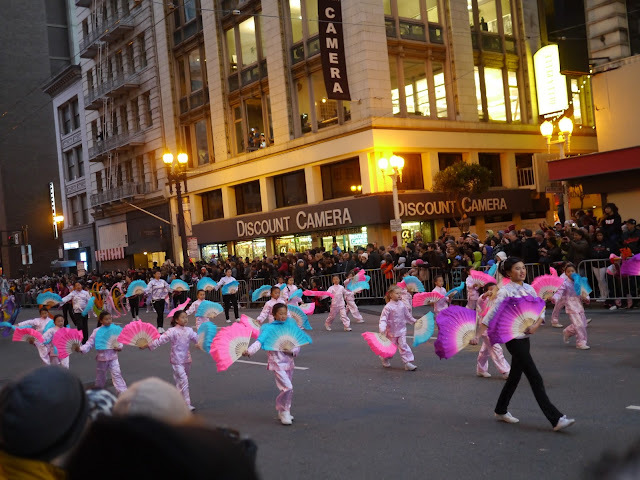 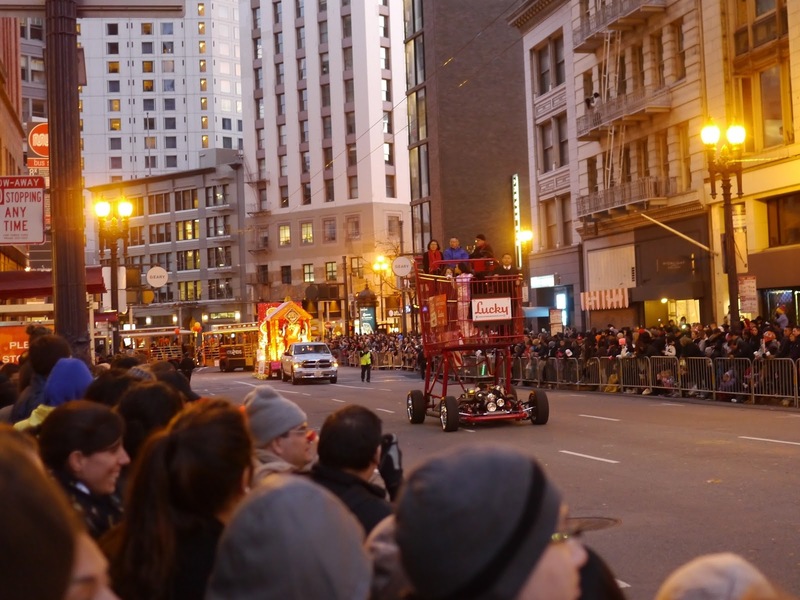 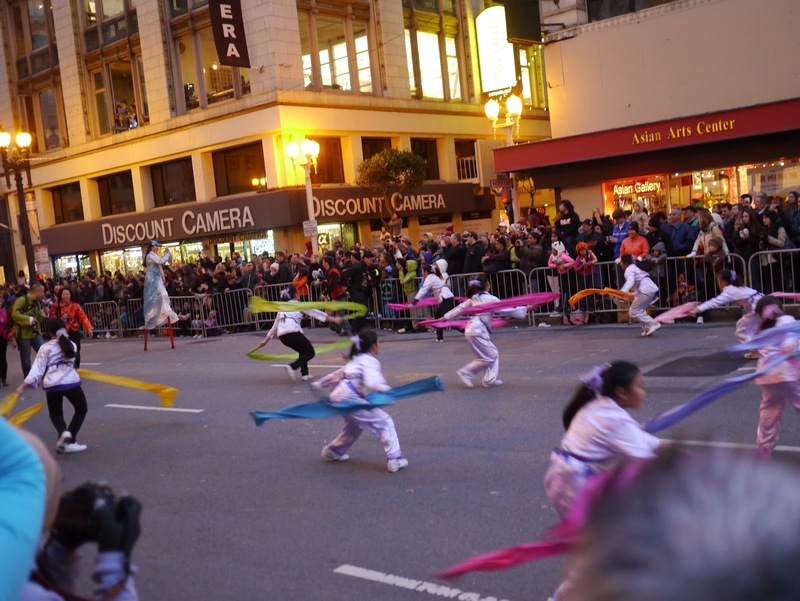 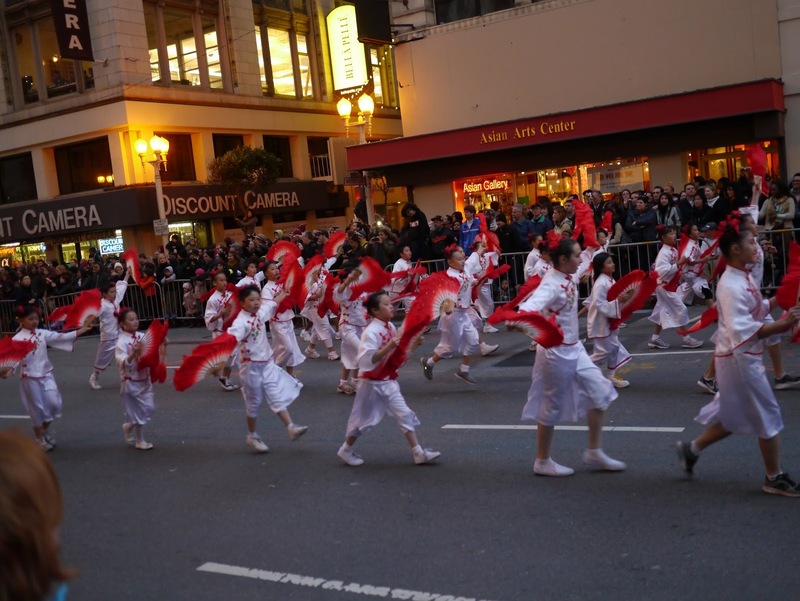 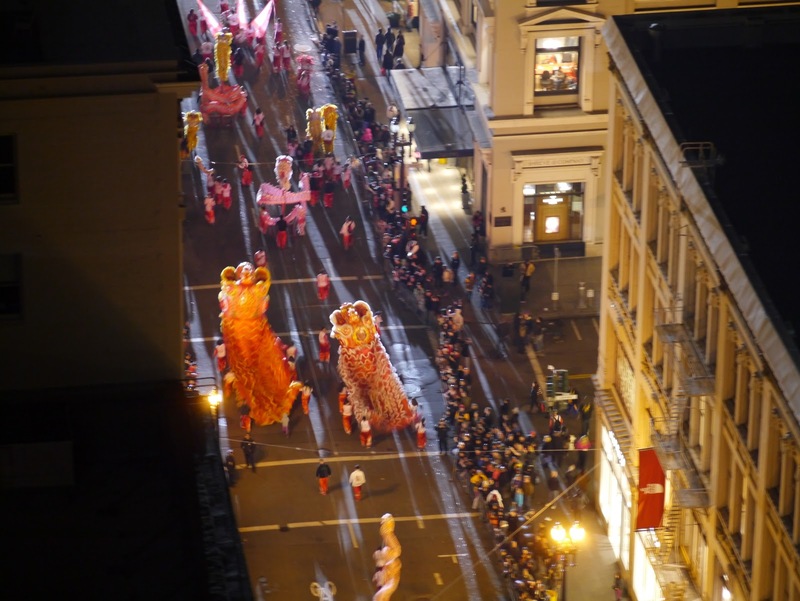 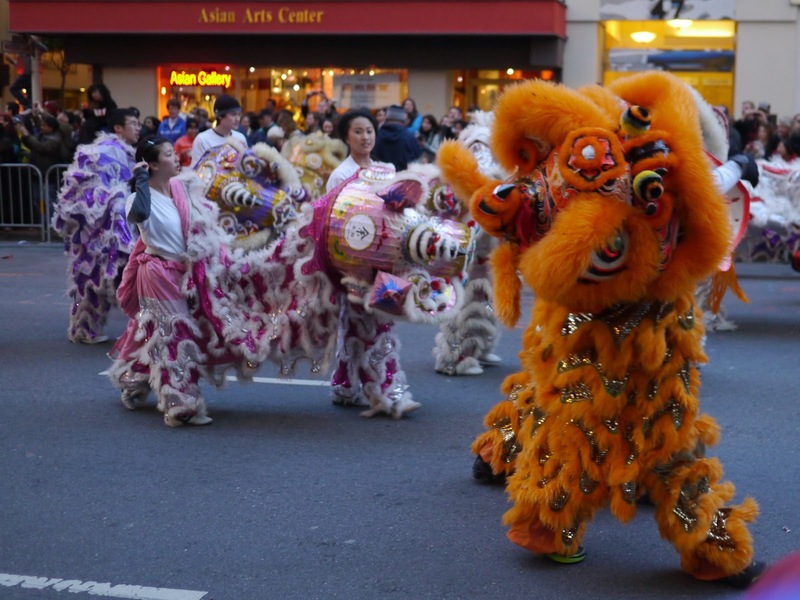 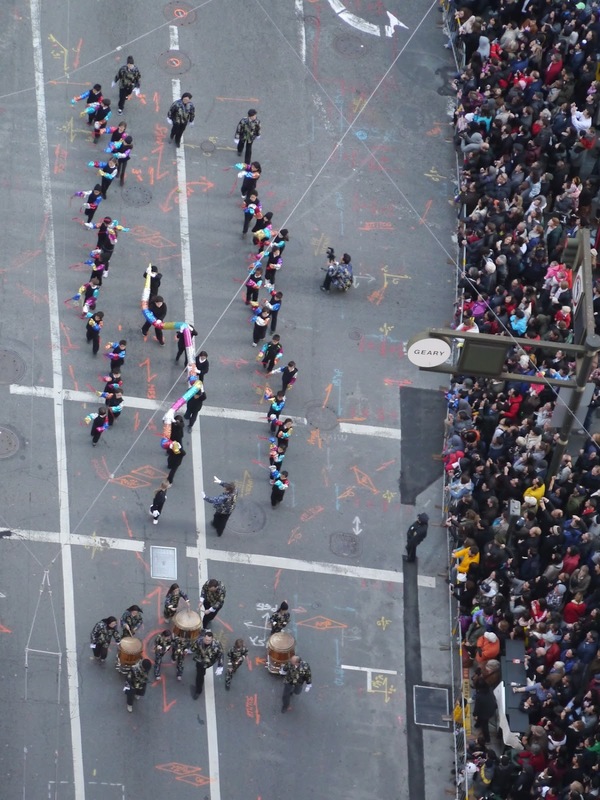 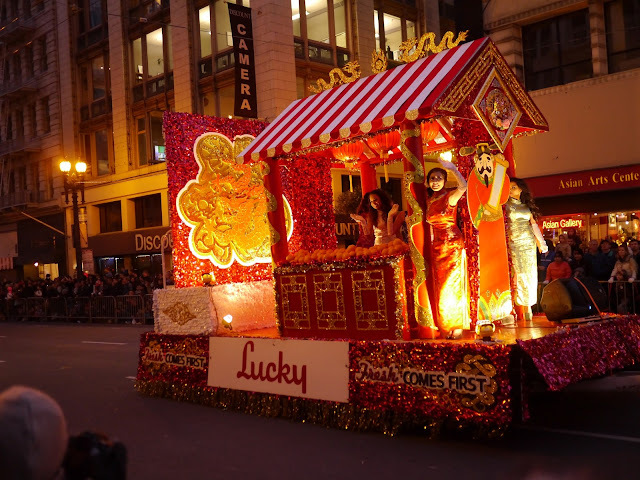 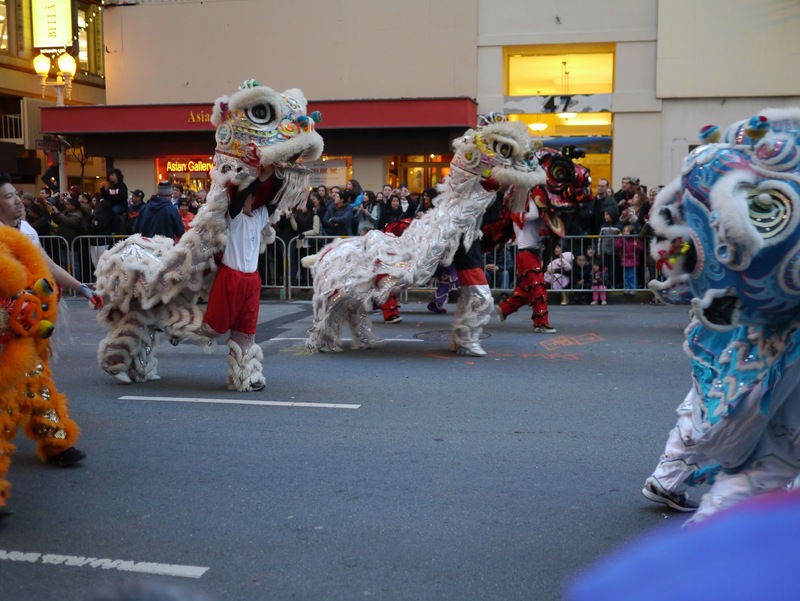 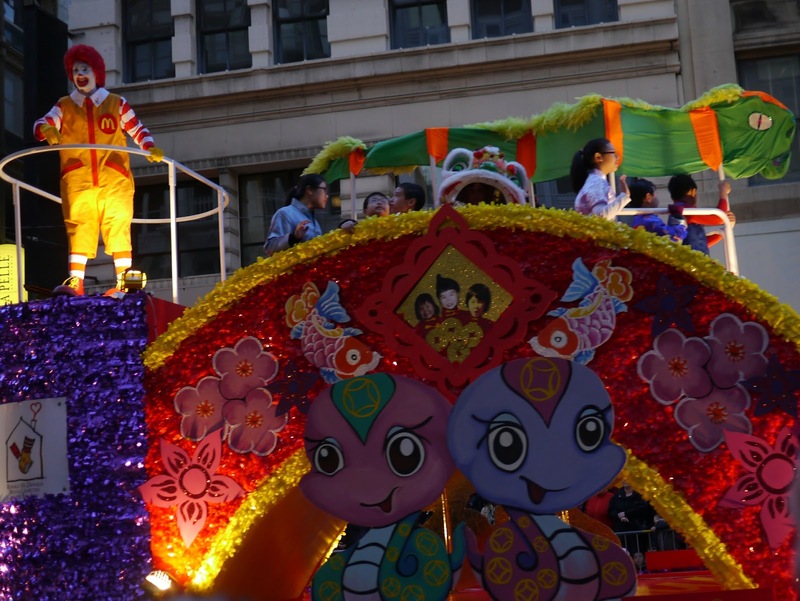 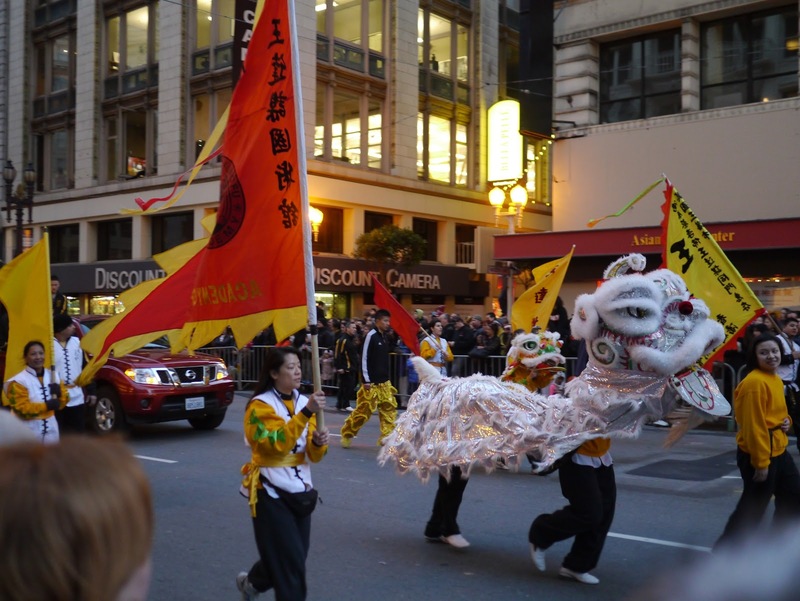 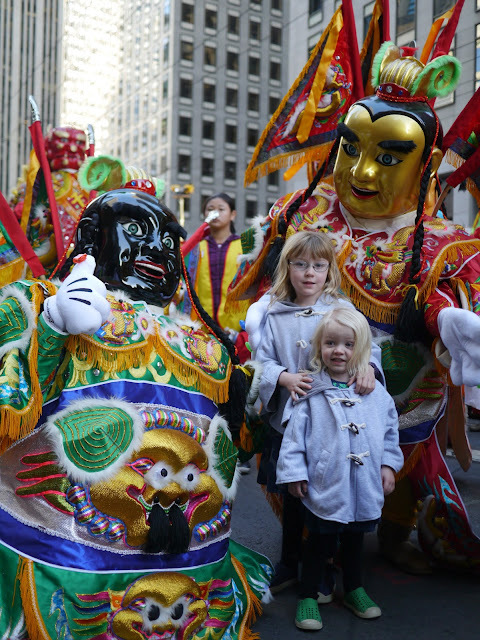 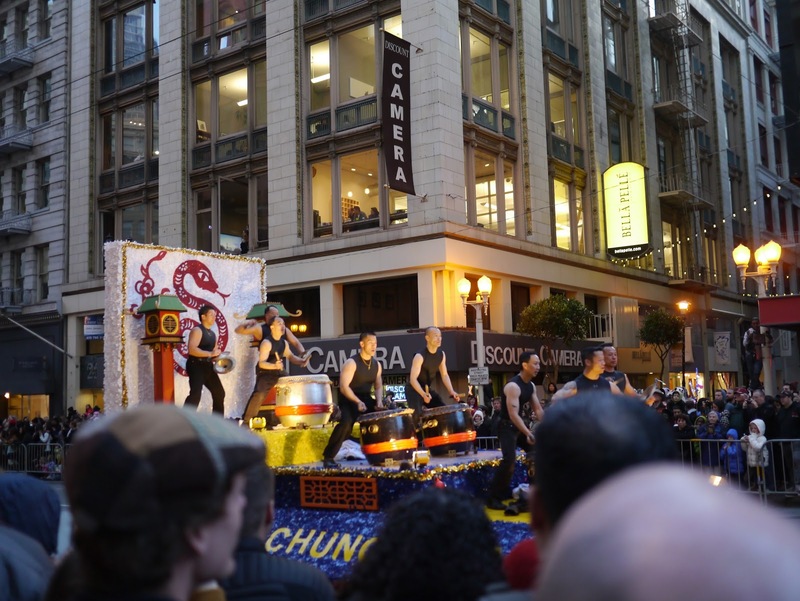 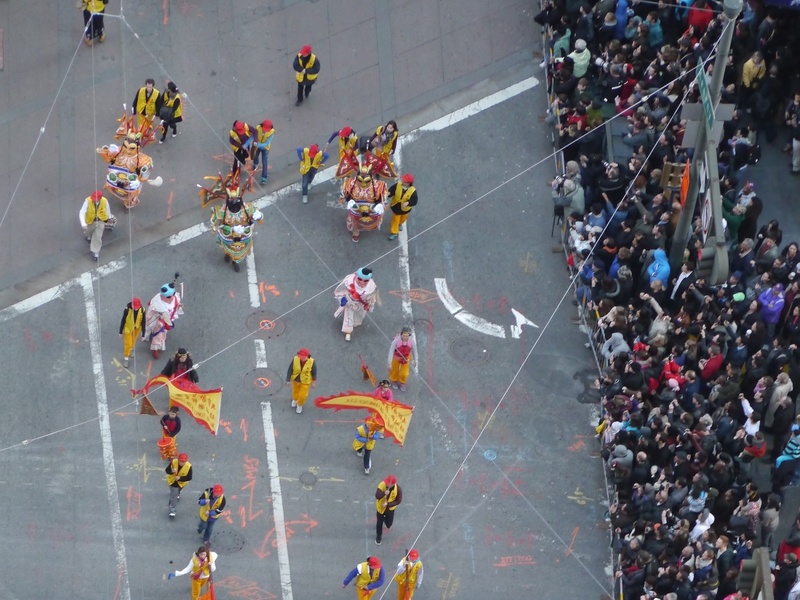 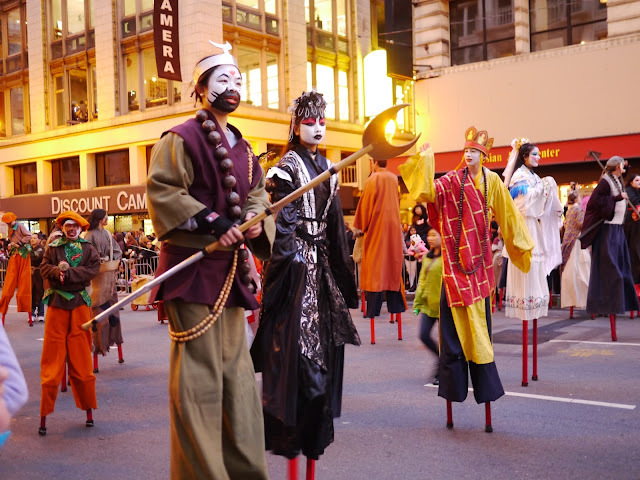 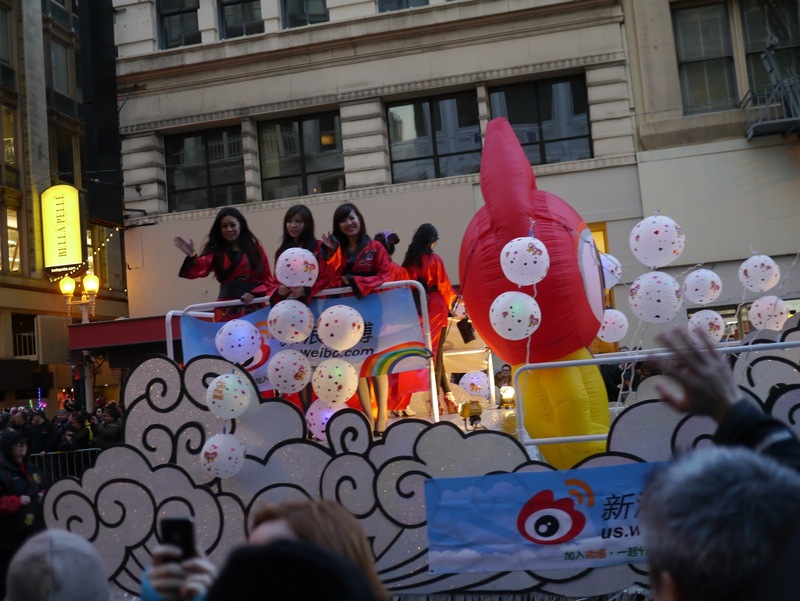 Every February San Francisco plays host to one of the biggest Chinese New Year parades in the world. 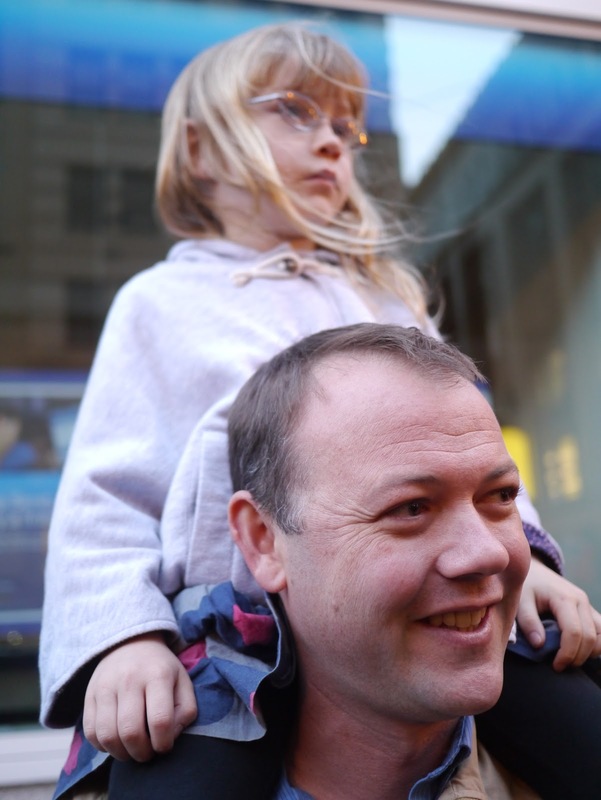 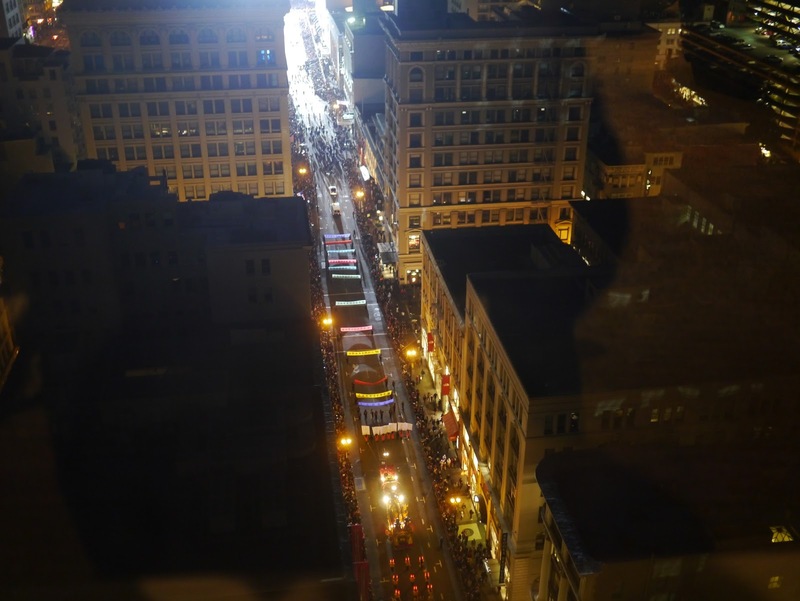 This year's parade was held last Saturday and was attended by thousands of spectators who lined the streets along the route. 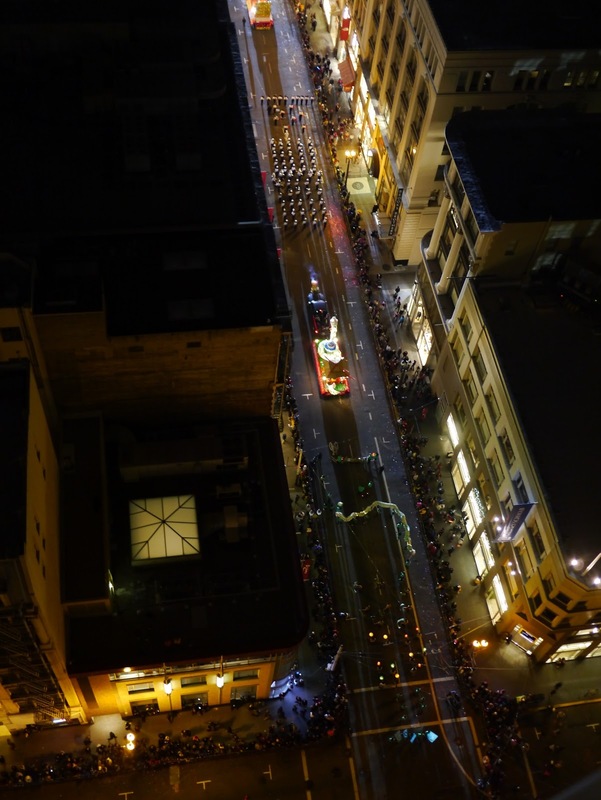 Just like last year we headed to Kim's work for a bird's eye view of the parade from the 21st floor. Last year the parade route just missed going directly past Kim's work however we still had great views along the sides of the building. This year the parade was changed slightly bringing the festivities directly past the front of Kim's work. Perfect! 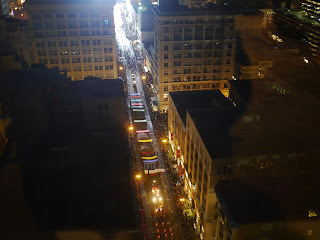 We spent much of our time watching the parade from upstairs however we did brave the cold and crowds and headed downstairs for a closer look early in the evening. 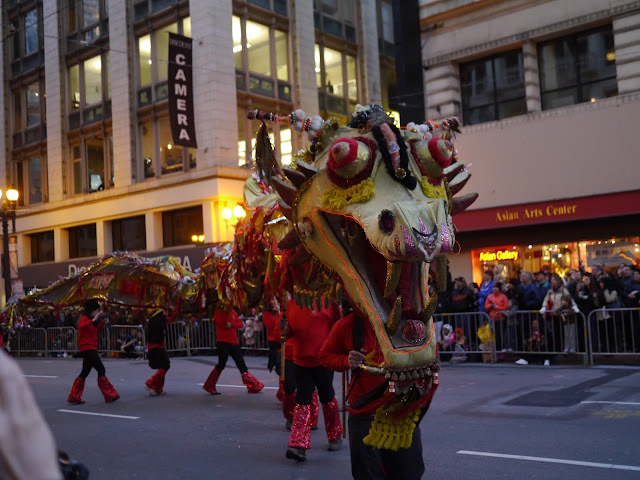 The girls loved watching the dragons up close and were especially excited by the lions that look like mini two person dragons. 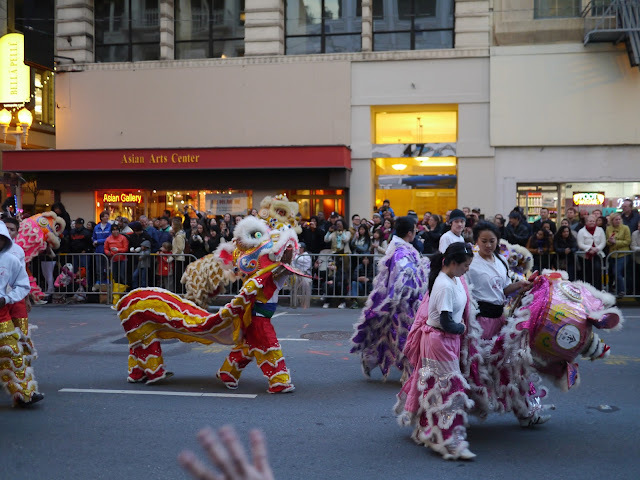 The lions tend to come in really close to the crowd along the parade route and there were plenty of squeals of delight as the lions shook their heads towards us. As well as the dragons and lions there were plenty of other performers involved in the parade: marching bands, dance troupes, drummers, stilt walkers, floats filled with waving people, people waving flags, people holding banners, fire trucks, even walking recycling bins, Ronald McDonald and a hot rod shopping cart! 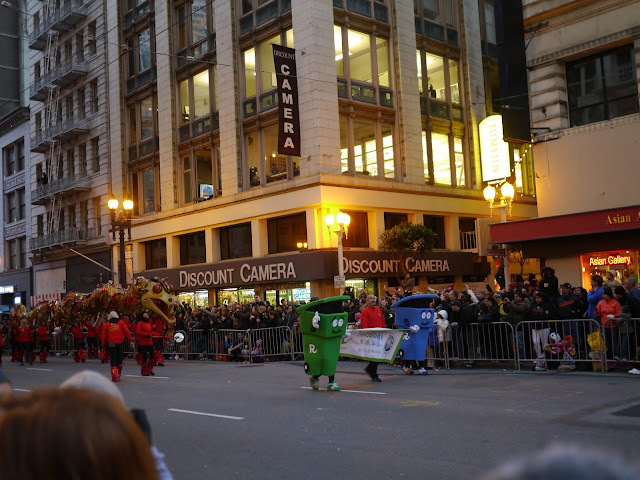 Even walking recycling bins joined in the parade! 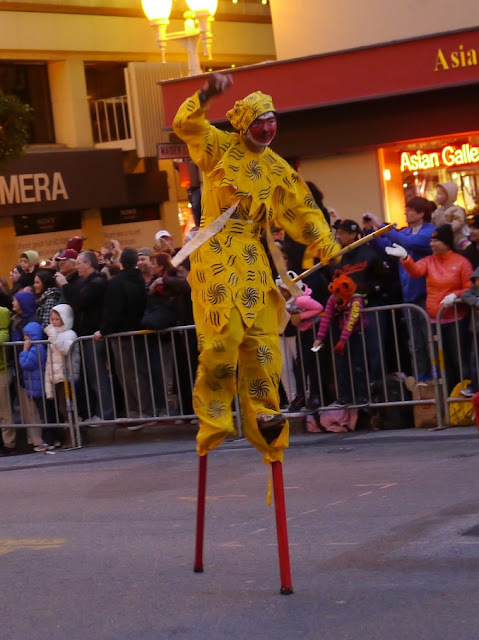 The stilt walkers stopped in front of us for some time. I felt sorry for them as they had to keep marching on the spot every time the parade stopped otherwise they'd fall over! When I think Chinese food I don't usually think of McDonalds! 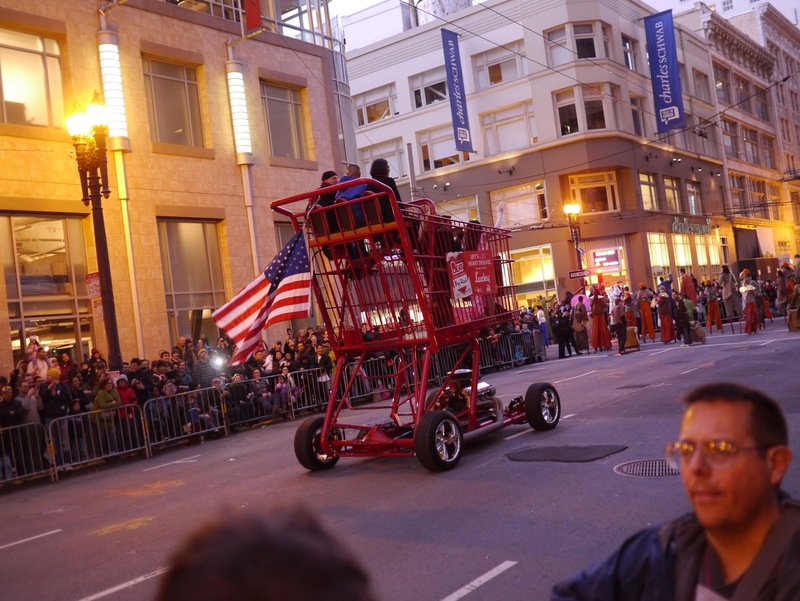 So that's what was making all those revving engine sounds! 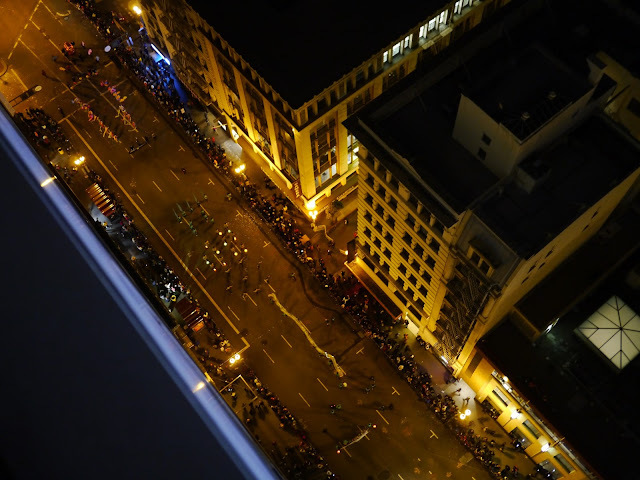 When it started to get a little cold for us outside, and the girls began to tire of the crowds, we headed back upstairs to watch from the balcony (also cold) and from inside. 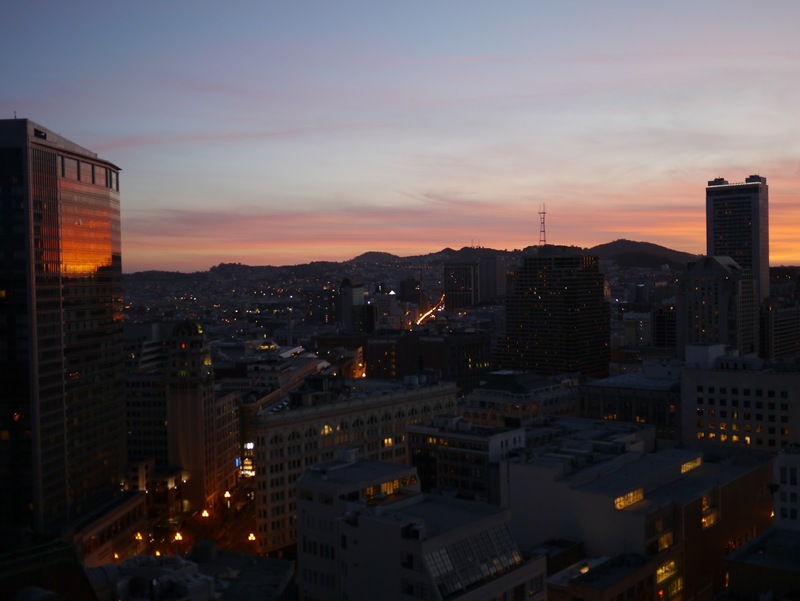 We arrived back upstairs just in time to see the sun setting spectacularly over the city. 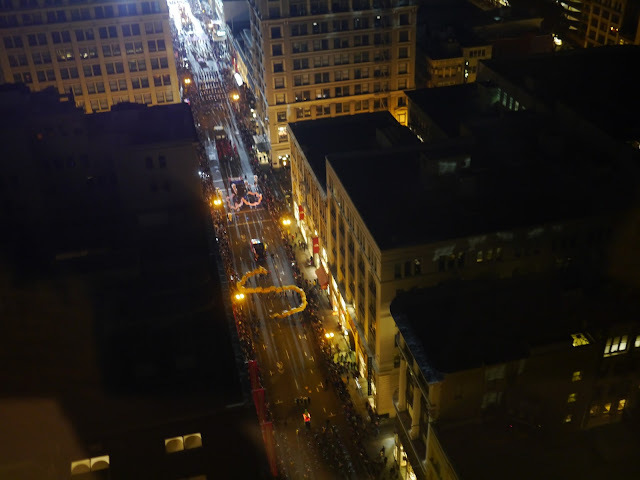 If only those bright spot lights for the parade weren't ruining my photo! 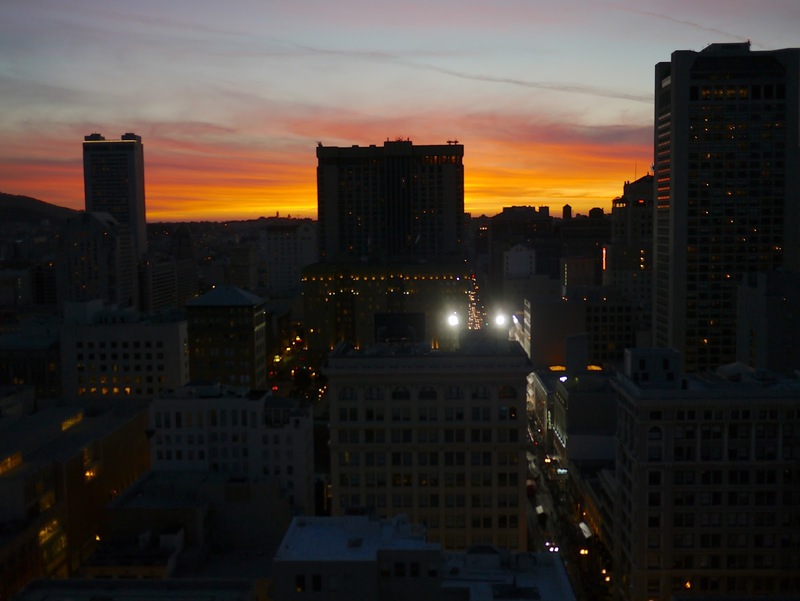 Beautiful sunset sky - and dazzlingly bright spotlights! 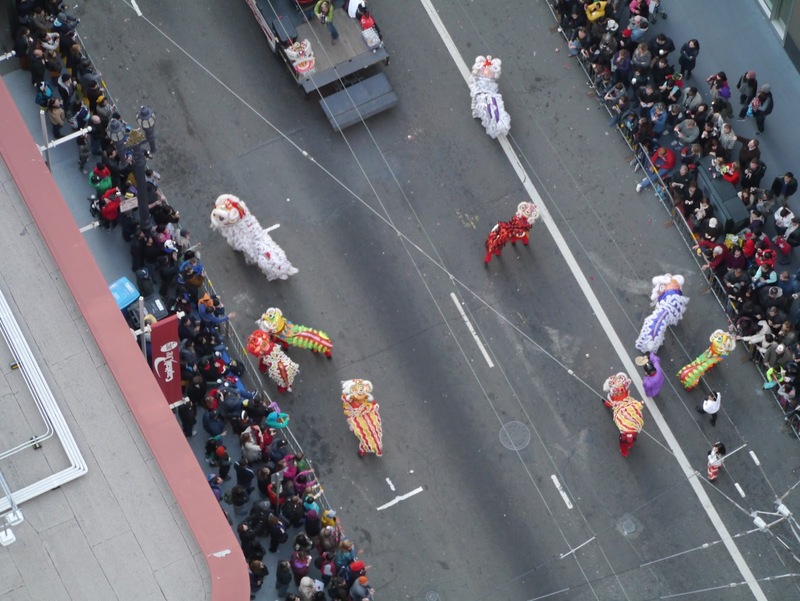 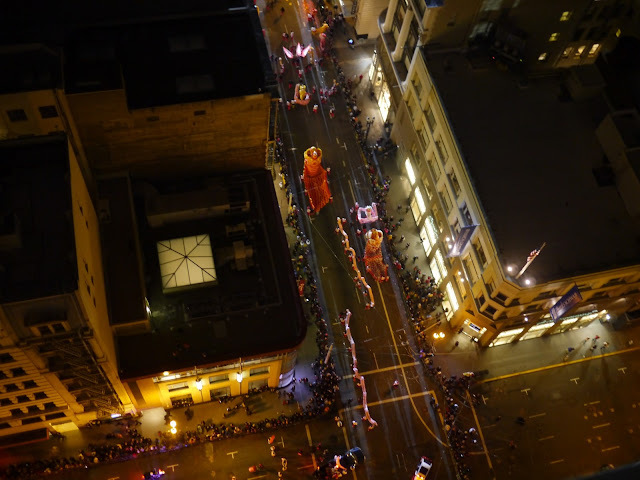 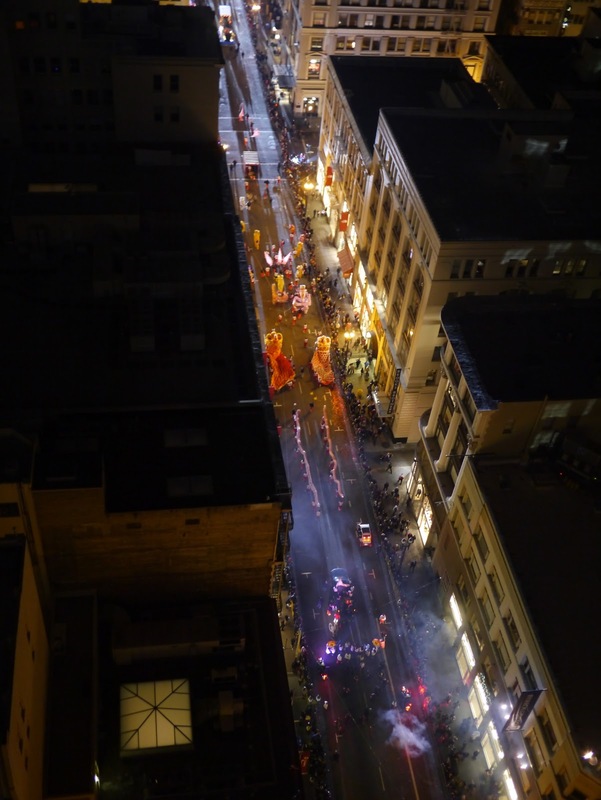 While it was great being downstairs and seeing the parade up close there's nothing like viewing it from above to get the full effect, especially of the dragons. Watching the dragons snake their way down the street, chasing a glowing orb and surrounded by firecrackers is just amazing. 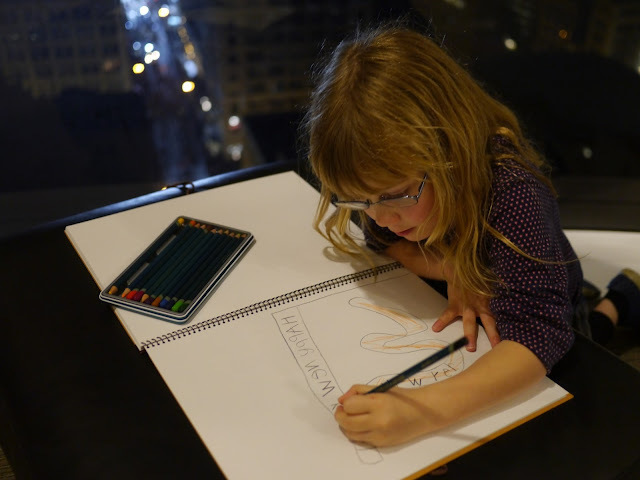 With her trusty Derwent pencils and artist's folio at hand Ava set about drawing the parade below. 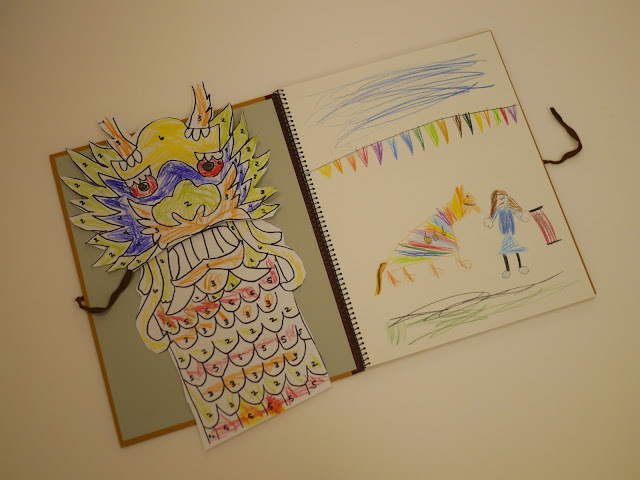 And when she'd had her fill of drawing there was a little dragon to play with. 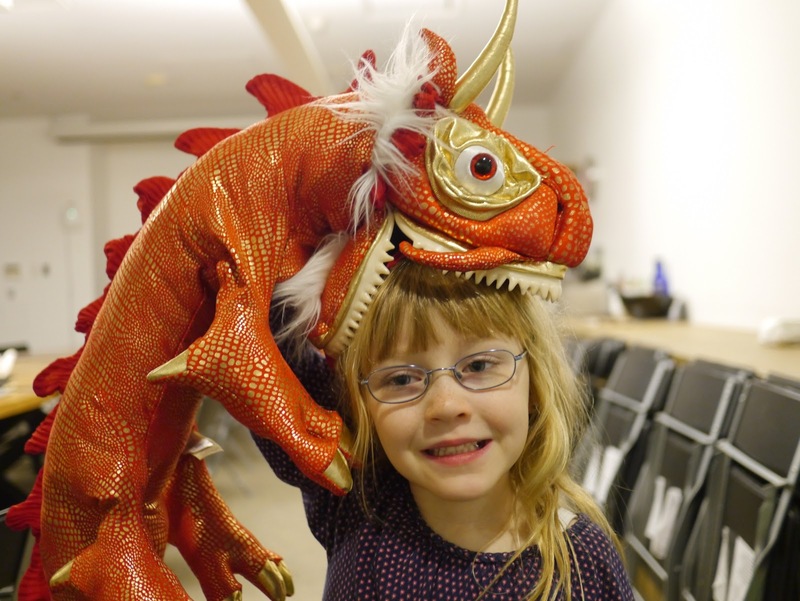 It did try and eat Ava's head though! 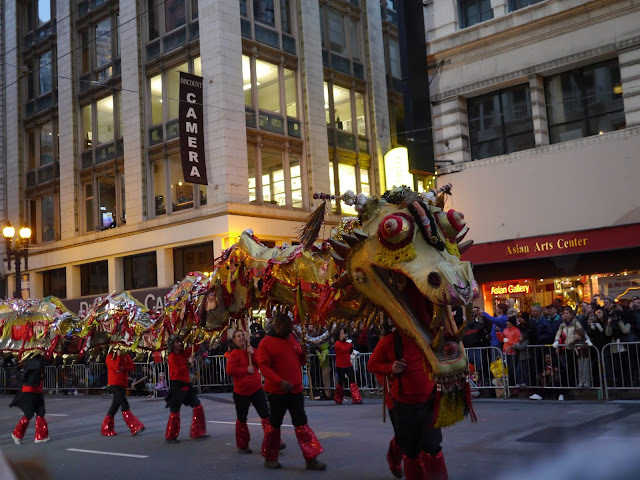 The end of the parade was marked, as always, with the largest lions followed by the largest dragon. 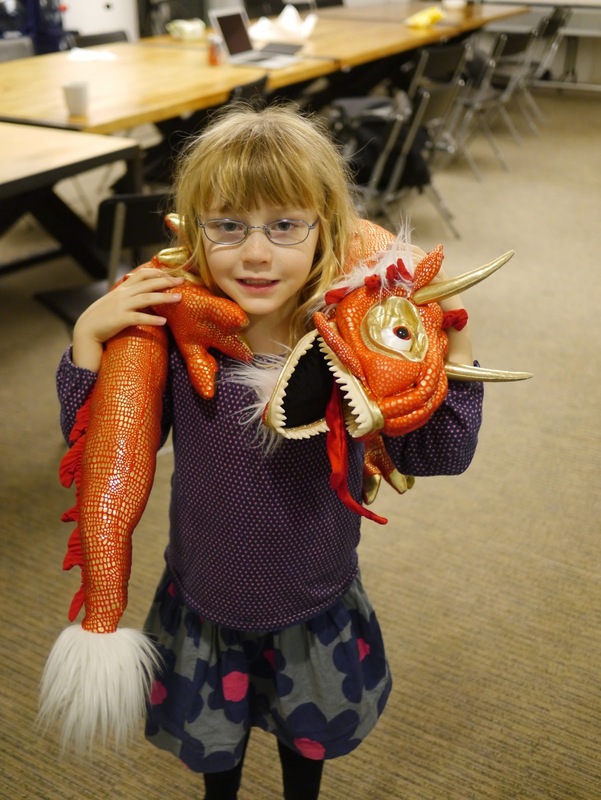 From my count the final dragon was carried by about 40 people, with quite a few helpers on hand. 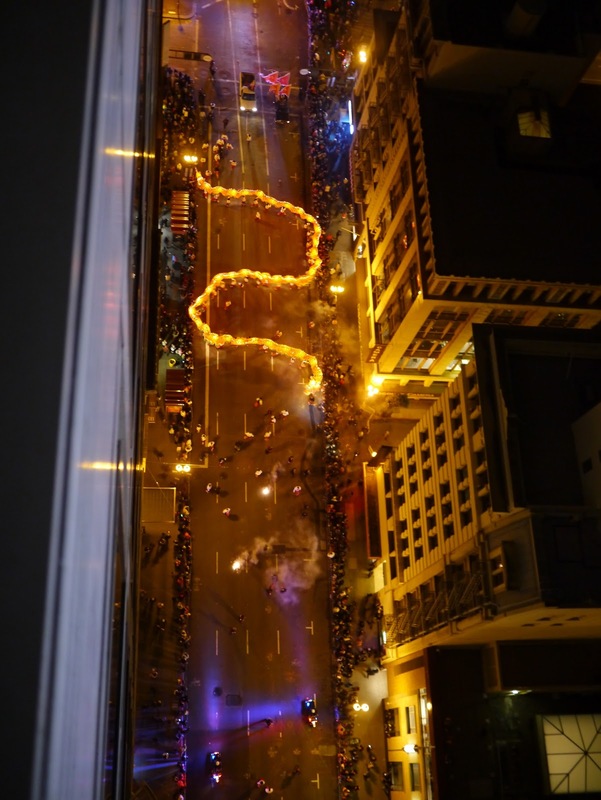 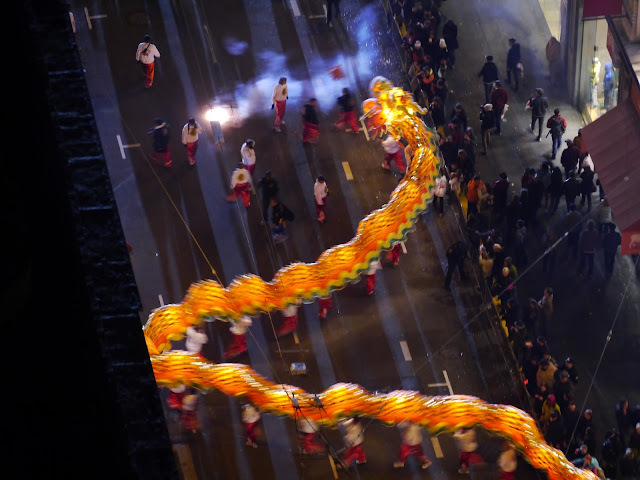 There were non-stop fire crackers booming and echoing up and down the streets as the glowing dragon made it's way along the parade route marking the end of another successful Chinese New Year parade for San Francisco.